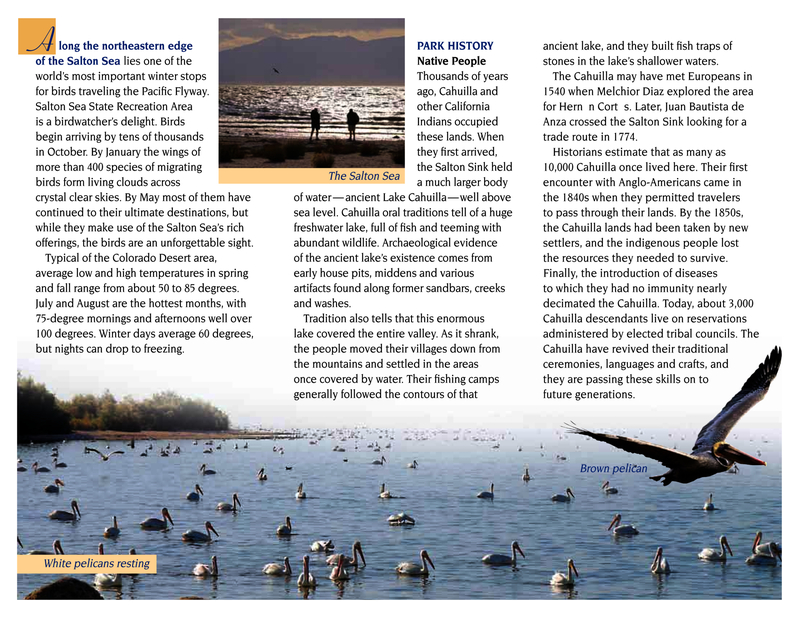 One of the world's largest inland seas and lowest spots on earth at -227 below sea level, Salton Sea was re-created in 1905 when high spring flooding on the Colorado River crashed the canal gates leading into the developing Imperial Valley. 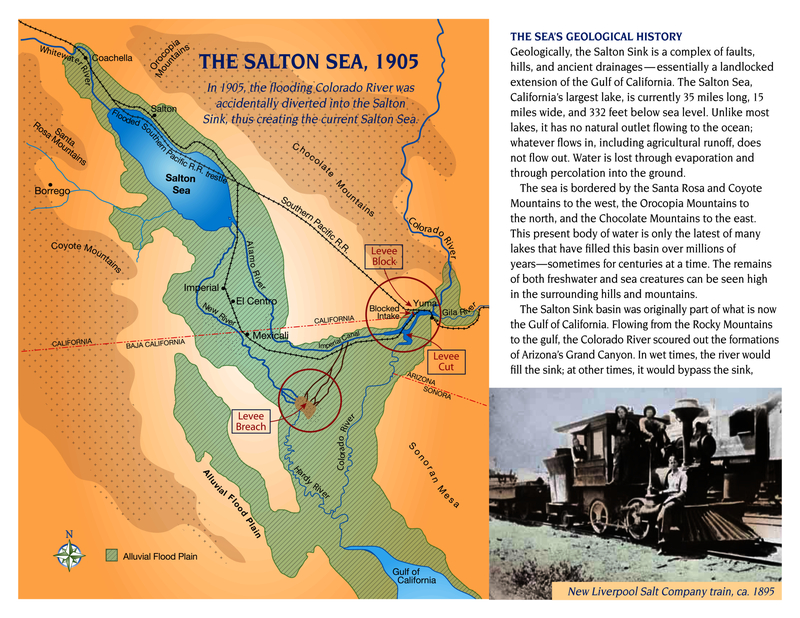 For the next 18 months the entire volume of the Colorado River rushed downward into the Salton Trough. 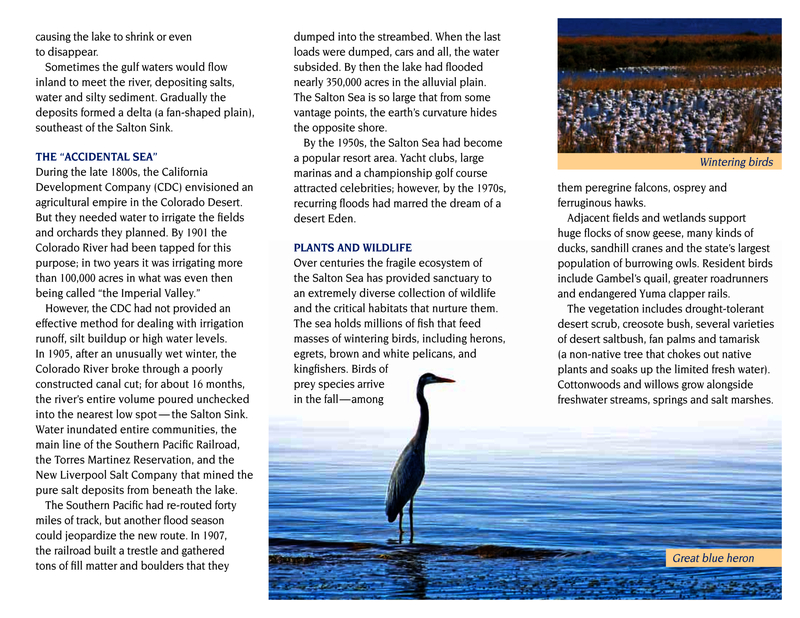 By the time engineers were finally able to stop the breaching water in 1907, the Salton Sea had been born at 45 miles long and 20 miles wide – equaling about 130 miles of shoreline. 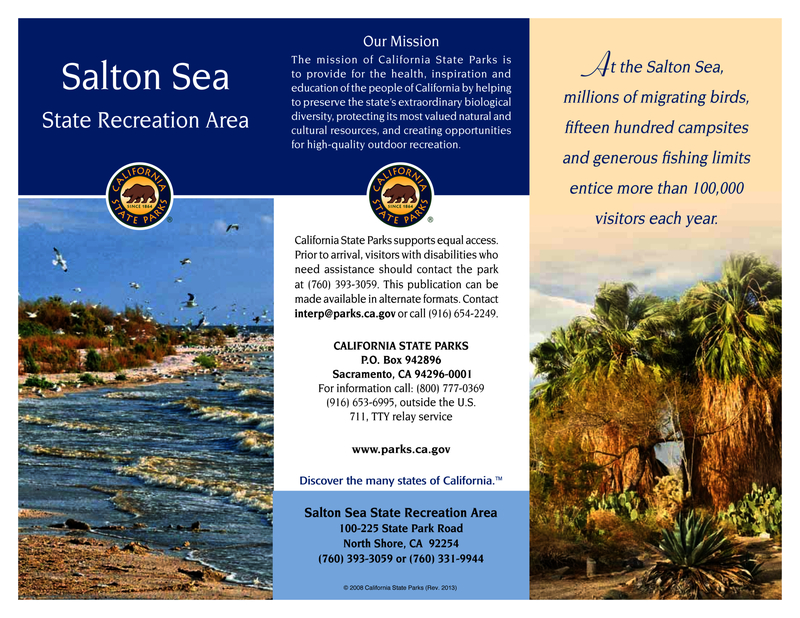 Salton Sea State Recreation Area covers 14 miles of the northeastern shore and has long been a popular site for campers, boaters and anglers. 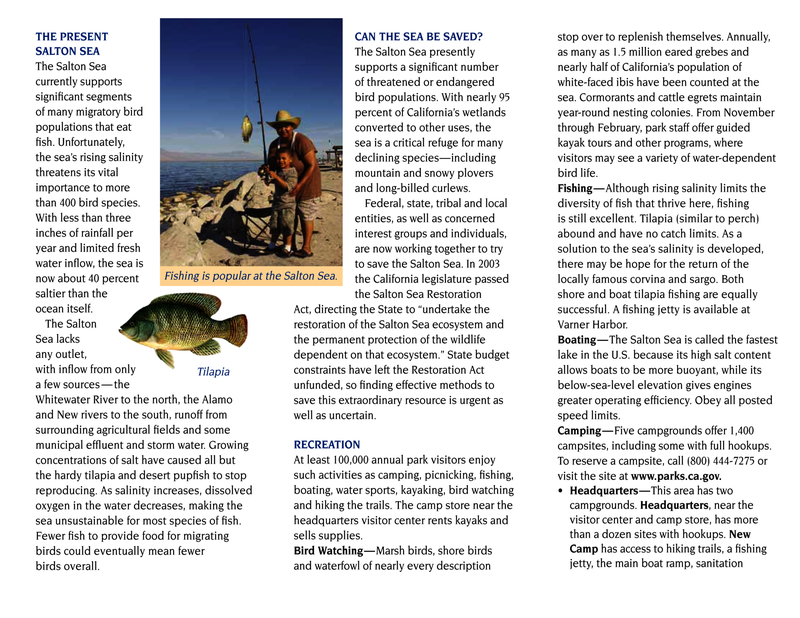 Increasing salinity in the Salton Sea basin has limited the number of types of fish that can be found there, and most fish currently caught are Tilapia. Varner Harbor within the SRA provides easy access to the sea for boating and water skiing. Kayakers, campers, birdwatchers, photographers and hikers can enjoy the site's many recreation opportunities. In desert country, carry extra water and other essential supplies, and stay on authorized roads. In case of trouble, remain near vehicles and in shade until help arrives. • Except for service animals, no pets are allowed on beaches. Animals must be kept on a six-foot leash, and in a vehicle or tent at night. Please clean up after pets. • Do not gather firewood — dead wood must be allowed to decompose naturally. Firewood is sold at most campgrounds. 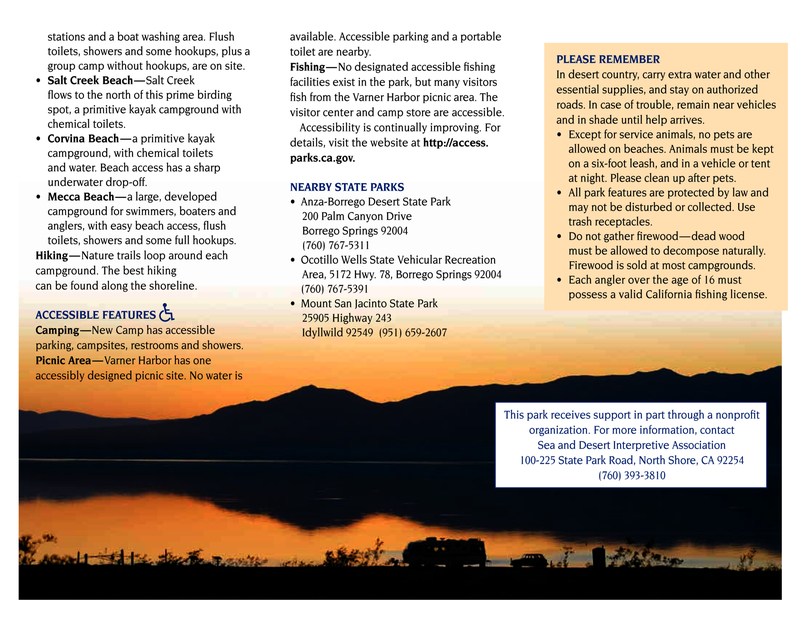 • Each angler over the age of 16 must possess a valid California fishing license. 30 miles south of Indio on Highway 111. 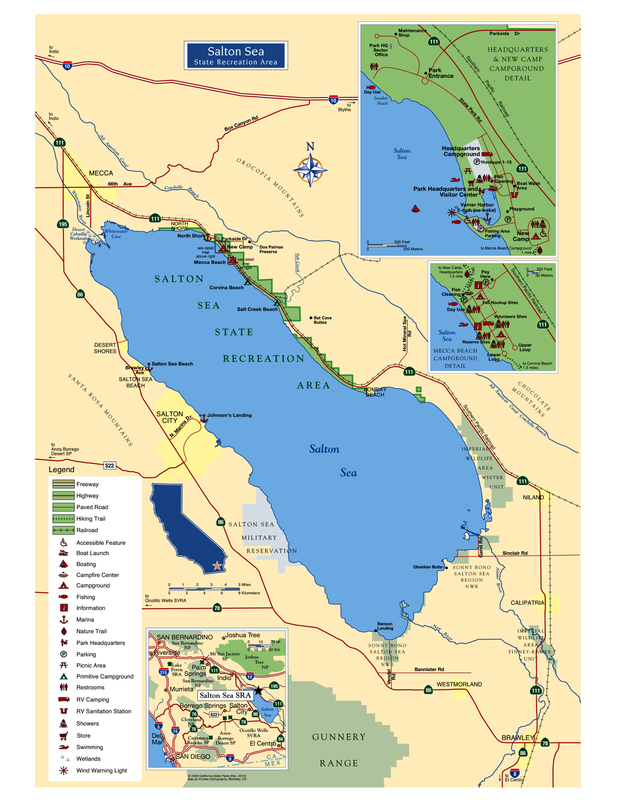 Located on the north shore of the Salton Sea, it is about a three hour drive from the Los Angeles or San Diego areas. From Los Angeles, take Interstate 10 east to Indio, take 86S exit then turn left at Avenue 66, then right onto Highway 111. Go south about 12 miles to the Salton Sea SRA Headquarters entrance. From San Diego take Highway 78 east, then left (north) on Highway 86 . Turn right at Avenue 66 and then right onto Highway 111. Go south about 12 miles to the Salton Sea SRA Headquarters entrance.